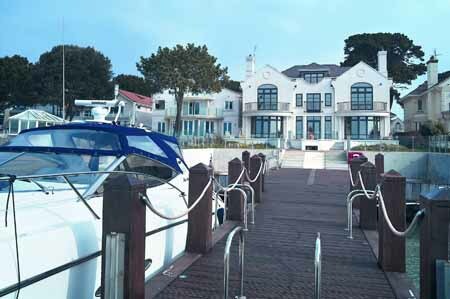 A spectacular new addition to the Sandbanks property market has been built using the ‘best materials money can buy’. Harrods Estates are selling Harbour Watch which sits on a plot of over half and acre and is one of only handful of properties that run along the water’s edge on Panorama Road. The south facing aspect looks over the distant Purbeck Hills and ensures that the six-bedroom house is bathed in sunshine all day long. A brand new twin berth marina, complete with hydraulic opening dock gates, is accessed from the back garden. There is a also a new jetty, pier and pontoon for mooring boats outside the marina. The whole house has state of the art AMX Home Entertainment and Home Automation systems. This enables you to pipe music to anywhere in the house off a central hard drive library, select a range of different TV systems into any room, set up endless combinations of light mood settings, automatically open/close curtains and blinds, pull up security camera pictures from numerous different camera points onto any TV in any room, day or night, and to listen to any DAB radio station in any room. The house also has plasma TV screens in almost every room, including a very large 55” screen mounted into the wall in the Lounge, and an 80” digital Cinema Screen system, which is designed to come down out of the ceiling in Lounge 2.